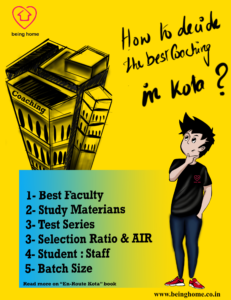 Which is the best coaching institute in Kota for IIT in 2019 ? Pre-read on How I decided. I decided to dedicate one full year of my life in pursuit of a dream, a dream of getting into IIT. Doubts and anxieties clogged my head. I knew this was a huge decision in my life and hence I wanted to be certain. At first, I wanted to choose a place where I wanted to pursue my coaching. Whether I should do it in my home town because it is more convenient, or should I look for other cities dedicated for IIT coaching? I had to ask my best friend, Google. After a certain level of research, I got to know, cities like Delhi, Hyderabad, Kottayam, and Kota are known for IIT coaching. But, amongst this the #city of Dreams, Kota stood out in terms of selection ratios and All India Rankers. Kota city, unlike other metros, is dedicated to IIT & Medical coaching. The city thrives purely on education. I made my decision, I wanted to be in Kota, because the city is dedicated towards education, I believe all the infrastructure will be build keeping students in mind. Next, I wanted to pick coaching institute. This could be the most important parameter influencing whether I will be able to meet my dream. Apart from Google, I asked my seniors and IIT Alumni for guidance. Their suggestions gave me a good starting point. They suggested the following major parameters that could greatly help me decide the coaching institute best fit for me. I decided to keep the coaching fees aside for the time being, as my parents were ok with spending on 1.3-1.5Lakh towards this. Keeping the above parameters in Mind, I decided to pull up the facts that could help me decide. I agree, this is the most important factor. If the teacher is motivating and engaging, even the most boring subjects can be fun to learn. On the contrary, if the teacher is not good, even the easiest and fun subjects could be boring. There are many Quora answers by students of Kota, that helped me get an indication of the best faculties for each subject. This is being provided by students based on the level of engagement of the faculty and ease of understanding a subject. This helps you get a reality check on how good your preparation is. The more challenging the materials, the better equipped you are for the final exams. An answer to this question, which study material is the best, is subjective and will be very difficult to compare as it depends on how many students refer the different coaching institutes study materials and test series. As far as my interaction with the students I have got to know Allen and Nucleus follows similar study materials and is considered to be amongst the most challenging ones currently, followed closely by resonance and Vibrant. Bansal being the oldest and the most experienced in the field of IIT coaching is considered to be the parent document for most institutes. Every other institute has improvised and refined their materials over the years. The outcome of the study materials can be seen with institutes rankers and selection produced over the years. However, students consider this parameter not so important as the others listed above. I tend to agree with this largely, However, it is also important to consider the students to staff ratio. Apart from the regular classes, students need extra monitoring during doubt classes. Therefore the number of qualified staffs available for this will greatly reflect on the student’s performance. Along with this, the personal monitoring of students is an important factor because it helps the student stay focused and motivated during his stay. Above all, hope this is helpful in making an informed decision on your child’s first step towards his big Dream. Do check our other student related blogs here. Disclaimer: The author has tried to his best to portray the information collected from various sources (Primary & secondary) for students to make a calculated decision on their coaching. The author nor this website (www.beingHome.co.in) does not take any responsibility of the information provided in this article. The author also does not hold any responsibility for any discrepancies in the data in the article. This entry was tagged #KOTACityofDreams, allen, Best coaching in Kota, coaching in kota, IIT JEE ADVANCED 2019, Kota Rajasthan, Resonance, Vibrant. Bookmark the permalink. Thanks Vamshi.. Will ceck your article too. Thanks Manas, We really appreciate your comment. Please do visit our other posts which will provide a lot of information regarding Kota. Thank you so much this blog is very informative. I am also planning to visit Kota and this was something that I was looking for. By the way, can you help? Are there any hotels in Kota near railway station? MATHSkart.in Tutorial Videos on YOU-TUBE For CBSE/JEE Students With Chapter Wise Syllabus of MATHEMATICS. 65 Playlists with HUGE Content to Watch “FREE of Cost”.